by drroberthefner.In Uncategorized.Leave a Comment on Is Your Nativity Flawed? As a reminder to our family and guests that Jesus’ birth claims center stage at Christmas, my wife loves to display nativity scenes. Last year, she purchased a new one. My son, 7 years old at the time, made a keen observation about it. Take a moment and look closely. Do you see what’s wrong with it? 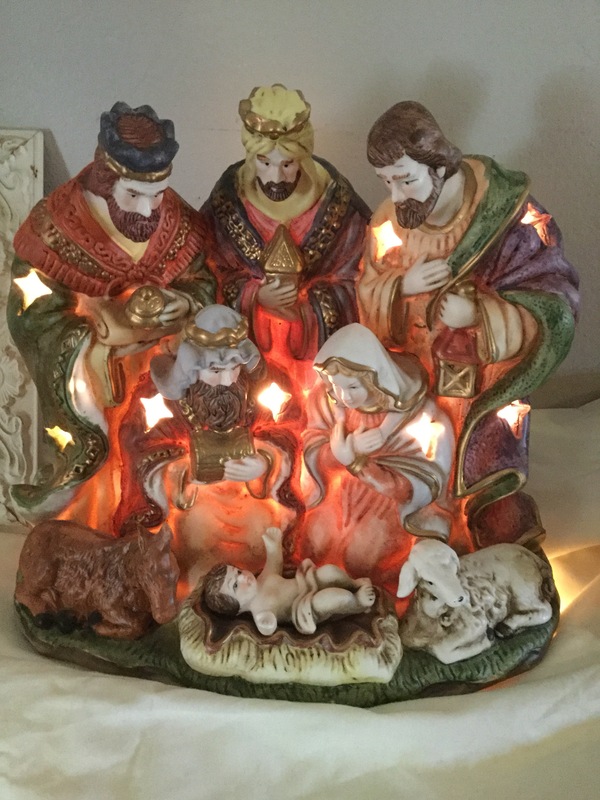 Now of course, I’m sure a few of you will notice that the Wise Men are there at Jesus’ birth. They likely didn’t arrive to worship Jesus until he was two or three years old. Their presence in many nativities squeezes Matthew’s and Luke’s account of Jesus birth into one image. While I disagree with the creative license, I can understand it. But that’s not what I’m talking about here. Look closely. Do you see it yet? At the signal of a star light over 2,000 years ago a baby came into this world to bring light—to be Light! At the announcement by the angels, a shimmering and foreshadowing light knocked back shepherds preparing the way for the greater Light born that day. On a mountain three decades later, Peter, James, and John would witness the unhindered glory of the Light on the Mount of Transfiguration. Not long after, the Light would appear momentarily to have been snuffed out in the crushing darkness on another mount—this one called Calvary, the place of the skull. But only three days following the Light would arise with the Sunday morning glory of resurrection, never to be faded, overshadowed, or darkened again. 14 You are the light of the world. A city set on a hill cannot be hidden. 15 Nor do people light a lamp and put it under a basket, but on a stand, and it gives light to all in the house. 16In the same way, let your light shine before others, so that they may see your good works and give glory to your Father who is in heaven. As his light-bearers, we’ve been entrusted to brighten the darkness around us with effervescent worship and illuminating witness. We are responsible to take his brilliance, wonder, and awe exposing it to dark places in the light he’s placed in us. In truth, this is a far more important nativity to have right. A plaster decoration that sits on our hall table isn’t likely to fail in its witness. As a light-bearer, I am to take his gospel to those lost and floundering in darkness. As a light-bearer, I am to worship joyously so that others, in the light of my changed life, can see the Light of the world clearly. As a light-bearer, I am to keep all dimmers, faders, and dark corners from weakening the brilliance and brightness of the true Light born at Christmas. Check your decorative nativities. Are they flawed? Does Jesus have center stage? Is he illuminated? Then check your nativity and be sure the Light has brightened you, and you are taking that light into the darkness. Next Next post: What’s Your Favorite Christmas Gift?